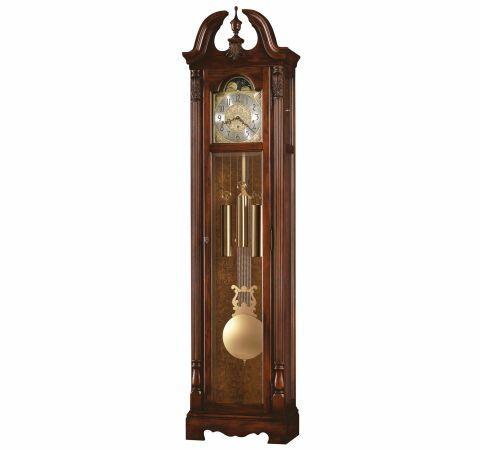 This classic floor clock features a swan neck pediment, and includes a turned finial with a decorative carving. Satin brass-finished dial features elaborate corner spandrels and center disk with a silver chapter ring and satin black Arabic numerals. An astrological, blue moon phase accents the dial. The brushed satin brass-finished pendulum and weight shells are set against a decorative olive ash burl patterned back panel. Beveled glass enhances the lower door. The top side glass panels are removable for easy access to the movement. Reeded columns include heavily detailed carvings and turned bottom caps which frame the door. The sculpted base features a decorative cutout.